Join us Wednesday, May 23, 2018 at 2 pm for a free informational session. 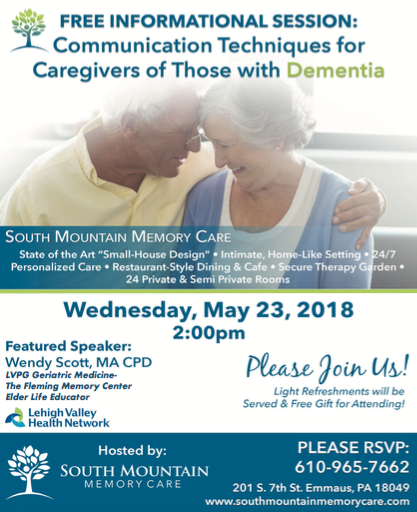 The featured speaker with be Wendy Scott, MA CPD, Elder Life Educator from LVPG Geriatric Medicine – The Fleming Memory Center. There will be light refreshments served and participants will receive a free gift for attending. Set a positive mood for interaction. Attitude and body language communicate feelings and thoughts more strongly than your words do. Facial expressions, tone of voice, and physical touch to help convey your message and show your feelings of affection. Getting attention. Limit distractions and noise—turn off the radio or TV, close the curtains or shut the door, or move to quieter surroundings. Address the person by their name, identify yourself by name and use nonverbal cues and touch to maintain focus. Ask simple, answerable questions. Ask one question at a time; those with yes or no answers work best. Refrain from asking open-ended questions or giving too many choices. For example, ask, “Would you like to wear your flowered dress or your blue dress?”. Displaying the choices helps clarify your question and can guide a response. Break down activities into a series of steps. This makes many tasks much more manageable. You can encourage with gentle reminders. Use visual cues, mimic the directions such as where to place a crayon on paper or a fork on a plate. Respond with affection and reassurance. People with dementia often feel confused, anxious, and unsure of themselves. Further, they often get reality confused and may recall things that never really occurred. Avoid trying to convince them they are wrong. Focus. Stay focused on the feelings that are demonstrated (which are real) and respond with verbal and physical expressions of comfort, support, and reassurance. Sometimes holding hands, touching, hugging, and praise will get the person to respond when all else fails. Use humor whenever possible, though not at the person's expense. People with dementia tend to retain their social skills and often love to laugh! According to the Alzheimer’s Association brochure titled, “Campaign for Quality Residential Care’s 'Dementia Care Practice,'” people living with Alzheimer’s in care facilities often exhibit a behavior described as “exit seeking” — the strong desire to leave the building and wander. Since wandering poses a serious health risk, making exits less obvious reduces visual cues for exiting. “It can result from the resident’s desire to return to a secure, familiar home or former workplace. The resident may be trying to reconnect with family members or may be following old habits, such as leaving for work in the afternoon. The resident may be drawn outside by a sunny day or have a desire for fresh air or a daily walk." In addition to many other strategies to prevent residents from wandering (and with the OK from the fire marshall), the Alzheimer's Association encourages care centers to disguise exits in ways that also bring beauty to a clinical setting. An added bonus? The murals and exit doors often beautify an otherwise sterile institutional space and bring a sense of peace to the residents. South Mountain Memory Care will be adding murals over the next few weeks. Please stop in for a visit and check out the art work. The longer you live the more likely you will develop a medical condition that requires surgery or a procedure. In fact, half of all people 65 and older will have at least one surgical procedure in their lifetime. And along with common potential side effects from anesthesia during surgery such as nausea, chills or muscle aches and itching, older patients are at risk for confusion or short-term memory loss. But, rest assured, there are steps seniors can take to minimize these side effects. Postoperative delirium — This is a temporary condition that causes the patient to be confused, disoriented, unaware of their surroundings and have problems with memory and paying attention. It may not start until a few days after surgery, comes and goes, and usually disappears after about a week. Postoperative cognitive dysfunction (POCD) — This is a less well understood but more serious condition that can lead to long-term memory loss and make it difficult to learn, concentrate and think. 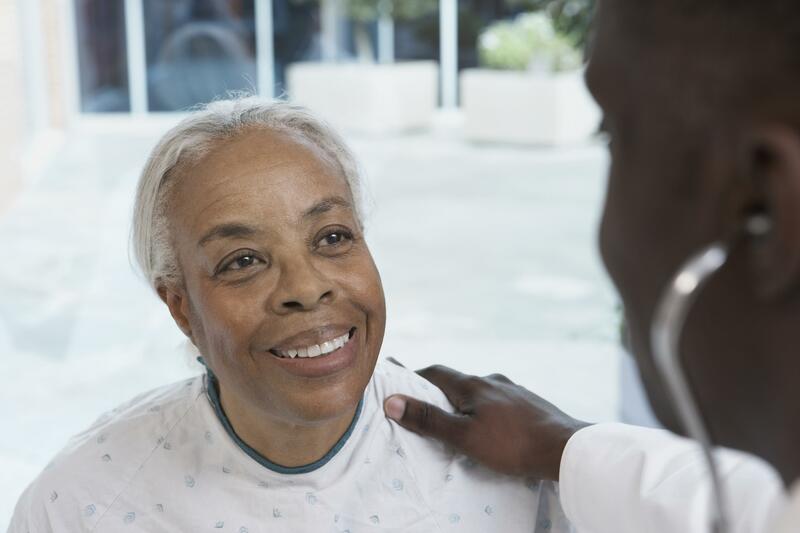 Because some of these problems are already common in elderly people and may be the sign of an underlying long-term cognitive decline, the only way to determine if a patient actually has POCD is to conduct a mental test before surgery. Researchers in anesthesia care continue to study and learn more about these conditions and how to prevent or reduce the effects.